Born circa 1948 - Died June 25, 2010 E.V. "Steady on laddie ... I can see these invisible bastards; you can not." What do you say about a man like F. Gwynplaine MacIntyre? What can you say about such a mystery man? We cannot say for certain where he was born, nor when, nor even what his given name was. He has told many a fanciful and conflicting tale about who he was, where he had been, what he had done in life. Fergus, or as some called him, Froggy, was a huge man of stature and girth with flaming red hair and bushy whiskers. He habitually wore gloves and the reasons given for this varied with each telling. To some he claimed he had webbed fingers, to others a hideous skin condition, and even that they were prosthetic hands. My favourite was the story that his fingernails had been plucked out by Idi Amin's soldiers. Personally I think he simply disliked shaking hands and touching things crawling with germs. It was in the 1970s, reportedly, that he adopted the name Fergus (sometimes Feargus) Gwynplain MacIntyre. No one, that is no one who is talking, seems to know what his given name was at birth. He has used a number of pseudonyms when ordering magazines, paying taxes and even on his passport, which possesses the name Paul Grant Jeffrey. His real name? Who knows? Gwynplaine is the name of a character in Victor Hugo's novel The Man Who Laughs, a wretched creature with an eternal smile on his face but who is a most unhappy protagonist. Certainly that choice of names said something about Fergus. As a writer of mostly science fiction, horror and fantasy, he had achieved more success than many writers, and still not enough to support himself. It was in the 1980's that he started to achieve success with his writing, having short fiction published in magazines such as Weird Tales, Amazing and Analog. 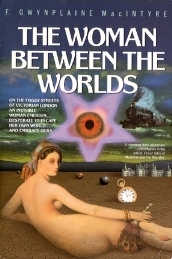 The Woman Between the Worlds was the only novel he had written under the MacIntyre name, copyright 1994 E.V. and reviewed on this web site. Poetry and humorous pieces that he had written were collected in MacIntyre's Improbable Bestiary. It's said that he was especially proud of his story Death in the Dawntime, published in The Mammoth Book of Historical Detectives, 1995, and Martian Walkabout, published in Isaac Asimov's Science Fiction Magazine, the December 1981 issue. In fact, Fergus, ghostwriting for others and published under various pseudonyms, has probably written more than we will ever know. Some of his contributions on the Internet in regards to old films is considered to be rather dubious insofar as their accuracy is concerned, and being quite a spinner of yards it is to be expected. When he had discovered my review of The Woman Between The Worlds on this site he wrote to thank me for it and at another time proceeded to spin yet another fine tale as to Aleister Crowley's true parentage. I wasn't buying it, but it was a good story and I printed that section of his message to me along with the review of The Enigma of the Warwickshire Vortex. There are more than a few obituaries and blogs on the Internet about F. Gwynplain MacIntyre, so there's no need to repeat too much of that information here. I would love to say that I knew Fergus well, but we shared only a few e-mails after my review of his book and later a few more when he wrote to thank me for the other review. He seemed to me to be a very sweet and gentle man, and I say that in the kindest way. And when, well after the event, I learned of his death, I felt as if I had suddenly lost a long time good friend. It has been reported that since the mid-eighties, Fergus lived in Apartment C9 of a building on the corner of 20th Avenue and 70th Street in Bensonhurst, a "working class area" of Brooklyn, New York, and that he was never known to have had visitors. He was heard by neighbours in the middle of the night, alone, hurling obscenities, cursing out his mother and blaming her for ruining his life. On June 25th of 2010 E.V., sometime after losing his steady print job, Fergus died as his apartment was gutted by fire. He was about 61 or 62 years of age. It seems to be almost certain that he himself set his flat on fire and took his own life. His body had been unclaimed for months when a spokeswoman for the Brooklyn morgue announced on September 8th that DNA testing was being done to positively identify the body and that a relative had been located to claim the last mortal remains of Fergus, although citing privacy policies that relative was not named, leaving the deceased author's given name a mystery still. 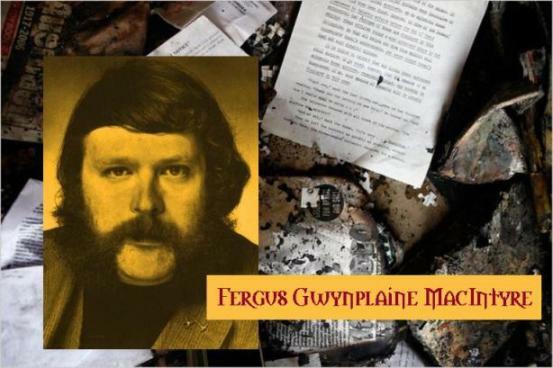 Some say the body found burned beyond recognition was not that of Fergus Gwynplain MacIntyre. Some claim that the body found amidst the charred remains of a cluttered apartment, filled with all manner of things including unpublished, half burned manuscripts, was that of a visitor, and that Fergus went off to Australia and is Down Under at this very moment. Me, I sometimes fancy he stepped through a doorway that leads to ... another place. A place where the likes of F. Gwynplaine MacIntire could be truly happy. "Now the beating of wings has grown louder, and beneath its under-edges I can hear ... yes, it starts: the whispering voice at the base of my skull. I am no longer alone in the cellar. EYE CAN SEE ALL THE"
The final lines in The Woman Between The Worlds by F. Gwynplaine MacIntyre.